The Iraqi Armed Forces are the military forces of the Iraqi government. They consist of the Iraqi Army, the Iraqi Air Force, and the Iraqi Navy. They were initially formed in the early 1920s. Six military Coup d'états were mounted by the Army between 1936 and 1941. The armed forces first saw combat in the Anglo-Iraqi War of 1941. They fought against Israel in the 1948 Arab–Israeli War, in the 1967 Six Day War, and in the 1973 Yom Kippur War. Two wars with the Kurds were fought in 1961–70 and 1974–75. A much larger conflict was the Iran–Iraq War, initiated by the Iraqis in 1980, which continued until 1988. 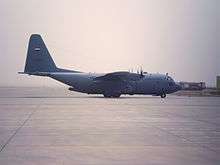 Thereafter Iraq began the Invasion of Kuwait, which led to the Persian Gulf War of 1991, which led in turn to confrontations over the Iraqi no-fly zones during the 1990s, and finally the Iraq War of 2003. The Iraqi armed forces have had mixed success at the strategic level but consistently poor tactical performance during most of their history. Iraq had one of the largest and strongest militaries in the world in 1990, before the Persian Gulf War of 1991. The armed forces are administered by the Ministry of Defence (MOD). Since the 2003 invasion of Iraq, which toppled the Saddam Hussein regime, the Iraqi Armed Forces have been rebuilt with substantial assistance from the United States Armed Forces. Since the implementation of the U.S.-Iraq Status of Forces Agreement on January 1, 2009, the Iraqi Armed Forces and the forces of the Interior Ministry are responsible for providing security and upholding law and order throughout Iraq. The Iraqi Army, in particular, is one of the most trusted national institutions of Iraq. Iraqi Armed Forces deficiencies have been identified in enabling functions, such as, e.g., logistics and military intelligence. In high-end conventional operations, Iraqi capabilities are currently limited by lack of artillery and air power. There are also concerns regarding corruption and sectarian agendas within the force. Article 9 of the Constitution of Iraq establishes the legal basis of the Iraqi Armed Forces. Much of the wording of Article 9 draws upon Article 27 of the 2004 Transitional Administrative Law. Part A, First Section, Article 9 states that 'The Iraqi armed forces and security services will be composed of the components of the Iraqi people with due consideration given to their balance and representation without discrimination or exclusion. They shall be subject to the control of the civilian authority, shall defend Iraq, shall not be used as an instrument to oppress the Iraqi people, shall not interfere in political affairs, and shall have no role in the transfer of authority.' Parts B and C prohibit the formation of military militias outside the framework of the armed forces and prohibit armed forces personnel from standing for political office or campaigning for political candidates. Part C expressively notes that military personnel are allowed to vote in elections. Part E expressively states the Iraqi Government's commitment to the respect and implementation of Iraq's international obligations regarding the non-proliferation, non-development, nonproduction, and non-use of nuclear, chemical, and biological weapons. The Second Section says that military service shall be regulated by law. T-72 tanks of the Iraqi Armed Forces in 2006. Iraq's legislation on defence dates from the Coalition Provisional Authority period of 2003–2004. 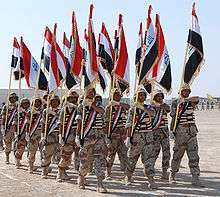 CPA Order 22 established the New Iraqi Army on August 18, 2003, and CPA Order 67 renamed the New Iraqi Army the Iraqi Armed Forces on March 21, 2004. In the process, the New Iraqi Army was expanded to include an Army, Air Force, Coastal Defense Force, reserve forces, and other elements. Iraq does not appear to have publicly issued a national defence review or white paper. Much of defence policy since 2003 has been set by the United States. For example, one mission objective for Multi-National Force-Iraq was an "Iraq that has a security force that can maintain domestic order and deny Iraq as a safe haven for terrorists". To do this, the U.S. aimed to train and equip Iraq's security forces and gradually transition security responsibilities to them. In 2010 there are at least three major defence tasks. They are the suppression of the insurgency, the resolution of the Kurdish Peshmerga forces' status in relation to the Iraqi Armed Forces themselves, and longer-term, the growth of the armed forces so that they can defend Iraq from external threats. The armed forces of Iraq as a modern country began to be formed by the British after they assumed mandated control over Iraq after 1917. During the March 1921 Cairo conference, it was agreed that an Iraqi Army would be created along British lines, with training and equipment provided by the UK. King Faisal wanted an army of 15,000–20,000 men. The army actually grew from 3,500 in 1922 to 7,000 in 1927 and then to 11,500 in 1932. The army became a modernising influence in the country. In 1931, the Iraqi Air Force was founded with a small number of pilots. Six Army coups took place, with one in 1936 being led by Bakr Sidqi and the last being the Rashid Ali coup of 1941. Following the persecution of the Assyrians, which culminated in the Simele Massacre of 1932, a conscription law was introduced, which strengthened the Iraqi Army at the expense of the tribal sheiks. In 1938–1939, Iraqi Army forces were concentrated near the Kuwaiti border, as the military portion of a policy by then-King Ghazni to encourage its union with Iraq. British forces later defeated the Iraqis in the short Anglo-Iraqi War of May 1941, during the Second World War. The Iraqi Air Force used British aircraft until the 14 July Revolution in 1958, where the new Iraqi government began increased diplomatic relationships with the Soviet Union. The Iraqi Air Force used both Soviet and British aircraft throughout the 1950s and 1960s. In 1961, Iraqi forces were again amassed along the Kuwaiti border, and Iraqi again threatened to invade. A quick British deployment of troops, aircraft, and naval vessels, called Operation Vantage, deterred any move though. Iraqi forces fought in the 1948 Arab–Israeli War, a first war against the Kurds from 1961–70, and then in the Six Day War of 1967. Iraqi participation in the Six Day War was limited, principally owing to the slow reaction of the Iraqi 3rd Armoured Division, which had been stationed in eastern Jordan. The 3rd Armoured Division did not organise itself and reach the front line before the Jordanians ceased operations. Therefore, Iraqi participation was limited to a Tu-16 bomber raid on Israel, which did not locate its targets, and a return Israeli air raid on the H-3 airbase, which was around 435 kilometers from Bagdad in western Iraq, near the H-3 oil pumping station. The Israelis reportedly destroyed 21 Iraqi aircraft for the loss of three of their own. After the first Kurdish war ended with a Peshmerga victory, the Iraqi military began to implement a number of changes. They concluded that Soviet equipment and methods did not meet their needs and that many western weapons were superior to their Soviet counterparts. Also the Soviet Union was trying to influence Iraqi policy by holding up arms deliveries. Despite the large amount of Soviet equipment that Iraq continued to receive (shown by the SIPRI Arms Transfers Database, Iraq 1973–1990), Iraq sought Western military equipment. Purchases from France included 64 Mirage F1 fighter-attack aircraft in 1976 and 200 AMX-30 tanks in 1977. That same year, Iraq ordered ten frigates and corvettes from Italy and in 1978 it purchased 200 Cascavel APCs from Brazil. While Iraqi generals supported a complete changeover to Western equipment, Western countries were reluctant to sell large amounts of weaponry to Iraq. Western weapons were more expensive than Soviet ones, and they took longer to train personnel on, so there was a reluctance to make a complete equipment reversal. However, more weapons were bought from various non-communist countries, supplementing their largely Soviet arsenal, and a reliance on Soviet doctrine reduced. In most cases, the Iraqis went back to British doctrine, while in others, they melded British and Soviet doctrine. Iraq's logistics capability was also improved, with the purchase of 2,000 heavy equipment transporters. Iraqi participation in the Yom Kippur War of 1973 took the part of a 60,000 strong Iraqi Army expeditionary force which operated on the Syrian front. However, the force did not perform very well, and the Iraqi Air Force did not do well either, losing 26 of the 101 fighter aircraft sent to Syria without shooting down any Israeli aircraft. The Kurds started the second Kurdish war of 1974–75, but the war ended in a Kurdish defeat after the Iranian–Iraqi Algiers agreement cut off Iranian support to the Kurds. From 1973 to 1980, Saddam largely relieved the armed forces of internal security functions by creating new paramilitary forces, such as the Iraqi Popular Army. He also guaranteed the military's loyalty to the regime by promoting loyal officers and purging questionable ones. However, this had the effect of filling the senior officer ranks with incompetents. Saddam Hussein's government then launched the Iran–Iraq War on 22 September 1980 with an invasion of Khuzestan province. After eight years of fighting, a series of Iraqi offensives in 1988 forced Iran to accept a ceasefire, though the perception that the United States had entered the war on the Iraqi side also induced the Iranians to agree. The Iran–Iraq War ended in 1988 with Iraq fielding the world's fourth largest military, with 49 army divisions, 6 Republican Guard divisions, over 900 combat aircraft in the Iraqi Air Force, and a small navy. This force had been built up with funding from the surrounding Gulf Arab states and billions in loans and funding given or secured by the U.S. State Department to support Iraq's war with Iran. An Iraqi Mi-24 (NATO code:Hind-D), captured during the 1991 Persian Gulf War. Saddam Hussein had also poured massive resources into regime protection agencies, like the Republican Guard (Iraq), that later took on a battlefield role. Losses during the Persian Gulf War from the United States-led coalition resulted in the reduction of Iraq's ground forces to 23 divisions and the air force to less than 300 aircraft. The Iraqi Popular Army was also disbanded. Military and economic sanctions prevented Iraq from rebuilding its military power. What rebuilding was done was concentrated on the Republican Guard and the new Special Republican Guard, created after the war ended. Iraq maintained a standing military of about 375,000 troops. Among the components of the military was the Directorate of General Military Intelligence. During the 1990s, the Iraqi Armed Forces were involved in suppressing the 1991 uprisings in Iraq, which led to refugees fleeing north in 1991. The U.S. launched Operation Provide Comfort with allied aid to provide assistance to these refugees. This involved some confrontations with the Iraqi armed forces. The Iraqi no-fly zones were established partially due to these operations. Operation Southern Watch dominated Iraqi airspace in the southern part of Iraq while Operation Northern Watch did the same in the north. As a result of Iraqi actions, cruise missile strikes on Iraq were launched in June 1993. Kuwait was then threatened with Republican Guard divisions in October 1994, which resulted in a major U.S. protective deployment designated Operation Vigilant Warrior. Operation Vigilant Sentinel was a later 1995–2007 operation of the same nature. More cruise missile strikes on Iraq were launched in 1996. 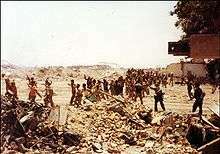 Iraq was bombed again in Operation Desert Fox in 1998. As U.S. preparations for an attack on Iraq gathered pace in 2002, Operation Southern Focus was launched, further damaging Iraqi air defences in the southern part of the country. In the 1980s and 1990s, Iraq built and used an arsenal of chemical and biological weapons, some of which have been alleged to come from the United States and its allies. These weapons were ordered destroyed by United Nations Security Council Resolutions. After a protracted and problematic weapons inspection process, the majority of these type of weapons were considered to be destroyed and their facilities sealed under UN weapons inspections. A new round of weapons inspections was performed in early 2003 by United Nations weapons inspectors led by Hans Blix, which searched Iraqi sites again, but found no new weapons or weapons programs. However, the Bush Administration decided that Saddam Hussein's regime must be removed, and it gave an ultimatum to that effect. Saddam's government did not respond to the ultimatum in the way that the Bush Administration wanted them to, and therefore, on March 19, 2003, the Coalition Forces of the United Kingdom and United States, with Australian, and Polish assistance began to invade Iraq. In the process, Saddam's military was defeated and dispersed. In the south, V Corps (United States), I Marine Expeditionary Force, and numerous divisions of the British Army, defeated the Iraqi 3rd Corps, the Republican Guard, and much of the Fedayeen Saddam. In the north, Task Force Viking, a special operations led task force, defeated the Iraqi 1st and 5th Corps and attached other Republican Guard elements. Significant battles included the Battle of Nasiriyah and the Battle of Baghdad. The British Army controlled the southern regions of Iraq and maintained a peace-keeping presence in the country until their withdrawal on 30 April 2009. The United States controlled Northern and Central Iraq. After the invasion, the Coalition Provisional Authority was established to administer the Post-invasion Iraq, 2003–present. The Iraqi military was formally disbanded and the Iraqi Military of Defense was dissolved shortly after the invasion, by Coalition Provisional Authority Order Number 2 of May 23, 2003. On June 25, 2003, the Vinnell Corporation was awarded a contract to train the first nine battalions, or 9,000 recruits, of a 44,000 person-strong "New Iraqi Army." The Coalition Military Assistance Training Team under Major General Paul Eaton was responsible for managing the process. On September 3, 2003, Coalition Provisional Authority Order Number 28 established the Iraqi Civil Defense Corps as a temporary security and emergency service agency for Iraq to complement operations conducted by Coalition military forces in Iraq. In April 2004, an Iraqi battalion refused to fight insurgents in Fallujah. Soon afterwards, the U.S. military structure in Iraq was reorganised. Multi-National Force-Iraq (MNF-I) was created under General George W. Casey, Jr.. For the new Iraqi armed forces, the most important move was the creation of Multi-National Security Transition Command - Iraq (MNSTC-I) as a subordinate command to MNF-I, under Major General David Petraeus. MNSTC-I was given the task of building up the new Iraqi Armed Forces, as well as the Ministry of Interior (Iraq) (MOI) and other security forces. A new force generation plan authorized an end-strength of ten Iraqi army divisions. On 22 April 2004, under Coalition Provisional Authority Order Number 73 all personnel, facilities, and equipment of the Iraqi Civil Defense Corps were transferred to the Iraqi Ministry of Defence as a component of the Iraqi Armed Forces. After the dissolution of the Coalition Provisional Authority on June 28, 2004, the Coalition stayed in Iraq at the request of the Iraqi government and under a UN Mandate to help the fledgling government develop its security forces and fight an insurgency. For periods immediately after the invasion, U.S. Army forces had seen the fighting as conventional 'fighting in built up areas (FIBUA),' rather than as an insurgency. After a review of the Iraq War military strategy in the end of 2004, General Casey directed the Coalition forces to shift their focus from fighting insurgents to training Iraqis. This was to be the strategy until 2006. The aim was a small Coalition footprint and a rapid handover of security responsibilities to the newly generated Iraqi security forces. Developing host-nation security forces became a cornerstone of the 2006 United States counter-insurgency doctrine. Soldiers of the 4th Battalion, 2nd Brigade, 5th Division stand outside an Iraqi army compound in Buhriz, Jan. 31, 2007. However, after national elections in December 2005, the Iraqi insurgency shifted focus from a resistance against the occupation towards a sectarian conflict. Accelerated by the Golden mosque bombing in February 2006, the levels of sectarian violence rose dramatically and the security situation deteriorated. In Baghdad, a cycle of sectarian violence accelerated in which Al-Qaeda-affiliated Sunni insurgents carried out suicide-bombings in Shia districts and Shia militias retaliated with killings in Sunni districts. It became evident that the Iraqi Armed Forces and the various MOI forces were incapable of putting a lid on the sectarian violence and protecting the population, and the MNF-I had to adjust plans again for a security transition. Even though Iraqi forces had received initial training and been equipped, they hadn't developed the capabilities needed to plan, conduct and sustain effective counter-insurgency operations. There were also challenges at the ministerial level, within the Ministry of Interior and the Ministry of Defense, and these ministries could not sustain their forces in terms of logistics, intelligence, communications and procurement. A by-product of the Iraq War troop surge of 2007 was that it provided the Iraqi security forces time for training and leadership development, as well as more Coalition partnering with Iraqi units. The commander of the Iraqi Assistance Group, Dana Pittard said June 2007 that the lesson learned was that Coalition forces should not draw down too quickly and that the transitioning of security responsibilities would take time. 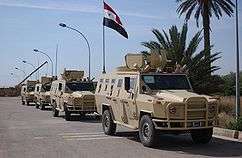 Dzik-3's used by the Iraqi Armed Forces in Basra. 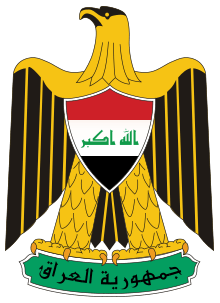 In July 2006, a milestone was achieved when the first Iraqi province transferred to Provincial Iraqi Control. Al Muthanna Governorate was the first province to meet this status. Twelve further governorates were transferred to Provincial Iraqi Control from September 2006 to October 2008. The Iraqi Army (IA) launched its first solely planned and executed high-profile division-level operation March 25, 2008 in the Battle of Basra (2008). The IA received Coalition support only in air support, logistics and via embedded advisors. A British infantry brigade stationed at Basra International Airport was ready in a tactical overwatch role, but it did not intervene. On January 1, 2009, the Provincial Iraqi Control process was superseded by the U.S.-Iraqi Security Agreement (see also U.S.-Iraq Status of Forces Agreement), which transferred all provinces' security responsibilities to the Iraqi government. Five provinces were transferred at once as a result. Iraqi security forces are composed of forces serving under the Ministry of Interior (MOI) and the Ministry of Defense (MOD), as well as the Iraqi Counter Terrorism Bureau, reporting directly to the Prime Minister of Iraq, which oversees the Iraqi Special Operations Forces. MOD forces include the Iraqi Army, the Iraqi Air Force and the Iraqi Navy. The MOD also runs a Joint Staff College, training army, navy, and air force officers, with support from the NATO Training Mission - Iraq. The college was established at Ar Rustamiyah on September 27, 2005. The center runs Junior Staff and Senior Staff Officer Courses designed for first lieutenants to majors. The Peshmerga, since September 2009 the 'Armed Forces of the Kurdistan Region,' are a separate armed force loyal to the Kurdistan Regional Government. The force is quite sizable. USF-I public affairs officers indicated that the KDP and PUK both have around 100,000 peshmerga (totalling 200,000) as of January 2010. The two divisions are included in this figure; the regional government and the central government disagree as to whether they are under Baghdad's authority and to what extent. Military intelligence has been rebuilt since the army was dissolved in 2003. However it has suffered from political interference. In mid 2009 Prime Minister al-Maliki reportedly dismissed Major General Jamal Suleiman, the director of military intelligence, and took on the job himself. The Prime minister had reportedly dismissed the director of Iraqi national intelligence at the same time. Two New Iraqi Army BMP-1s at Coalition checkpoint in Tarmiya, Iraq, 25 June 2006. New Iraqi Army BMP-1 on the move. The Iraqi Army is an objective counter-insurgency force that has been developed by the government of Iraq from 2003 to 2009 in cooperation with the Multinational force in Iraq, with the majority of the assistance coming from the United States. The force generation plan as of November 2009 includes 14 divisions, each division consisting of 4 brigades. The Iraqi army is described as the most important element of the counter-insurgency fight. The tactic is to provide security and other services on a local level by using infantrymen on dismounted patrols. As insurgents lose the passive or active support from the local population, they will easily be defeated, it is believed. Light infantry brigades are equipped with small arms, machine guns, RPGs, body armor and light armored vehicles. Mechanized infantry brigades are equipped with T-54/55 main battle tanks and BMP-1 infantry fighting vehicles. The Hungarian Armed Forces have donated 77 Soviet-made T-72 tanks from their own arsenal. The tanks have been refurbished by Hungarian specialists and were delivered in fully battle-ready condition in 2004. Training personnel was also provided to the newly forming Iraqi army. Iraq will be receiving 280 M1A1M tanks from 2010 and 2013. From its creation in 1922 to 2003, the army suffered from a number of serious difficulties, junior tactical leadership among them. "Iraqi forces consistently had problems because of a dearth of technical skills and a limited exposure to machinery. "However it also had significant strengths, particularly in two areas: logistics and combat engineering. 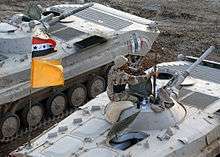 Two impressive logistical accomplishments of the army included the ability to sustain an armoured corps in Syria during the Yom Kippur War and their ability to move formations of corps size from one end of the country to another in days during the Iran–Iraq War. Since 2003, creation of combat forces has been the priority, and logistical support was initially supplied in one way or another by the coalition. As of mid 2008, logistical problems included a maintenance crisis and ongoing supply problems. Logistical capabilities have been developing, however, and the build-up of a nationwide logistical structure, with the Taji National Depot at its centre, is now well under way. A patrol boat prior to being delivered to the Iraqi Navy. The Iraqi Navy is a small force with 1,500 sailors and officers, in addition to 800 marines, designed to protect Iraq's shoreline and inland waterways from insurgent infiltration. The navy is also responsible for the security of offshore oil platforms. It will have coastal patrol squadrons, assault boat squadrons and a second marine battalion. The force was to consist of 2,000 to 2,500 sailors by the year 2010. The Iraqi Navy possesses 16 patrol boats, 35 assault boats, and 1 offshore picket vessel. Poor levels of internal security have stifled attempts to build any national banking or credit systems. In lieu of such organizations, Iraqi units operate at any given time with an estimated 10–20% absenteeism rate due to soldiers temporarily leaving their units to deliver their pay back to their families. This can be especially grueling if the unit is on deployment outside of their home province as the absenteeism time is naturally increased. In addition, all military hospitals under the Saddam regime were looted and abandoned during the 2003 invasion of Iraq; thus as of April 2007 the Army had no military hospitals. There is only one military prosthetics facility in the country and virtually no mental health or burn treatment services. Wounded Iraqi soldiers are expected to receive treatment either at civilian hospitals or if possible, at Coalition medical facilities. Corruption practices spurred partly by over-taxation at these civilian hospitals significantly drive up costs to the soldier. Due to overwhelming red tape within the Iraqi military compensation system, it is commonplace for the soldier to end up bearing the financial brunt of medical expenses. 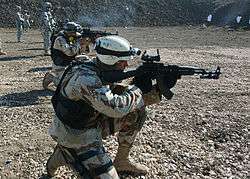 From 2003 to 2010, the United States Armed Forces took the major role in assuring Iraq's exterior defense. The U.S. command responsible was initially Combined Joint Task Force 7, then Multi-National Force – Iraq, and is now United States Forces – Iraq. USF-I was established on January 1, 2010, and withdrew on December 31, 2011. Residual assistance efforts are now managed by the Office of Security Cooperation, Iraq, headed by Lieutenant General Robert L. Caslen. OSC-Iraq was established on October 1, 2011. In 2010, U.S. Army Major General Tony Cucolo mentioned Operation Bright Star as an example of a possible joint training exercise component of a future U.S.–Iraq military-to-military relationship. While Iran has been accused of involvement in the Iraqi insurgency, the Iranian government also publicly offered help to build up the Iraqi armed forces. Then-Iraqi Defence Minister Saadoun al-Dulaimi met with his Iranian colleague Rear Admiral Ali Shamkhani in Tehran in 2005, and the Iranians pledged to give assistance. ↑ "CIA – The World Factbook – Iraq". Central Intelligence Agency. Retrieved 25 June 2016. ↑ "CIA – The World Factbook – Military Expenditures: Country Comparison to the World". Central Intelligence Agency. Retrieved 25 June 2016. ↑ Pollack 2002, p.264–66. Pollack notes that two strong categories for Iraq have been logistics and combat engineering. Iraqi soldiers have also usually fought hard in difficult situations. ↑ "Iraq Chief, Boasting of Poison Gas, Warns of Disaster if Israelis Strike". The New York Times. 3 April 1990. Retrieved 24 June 2016. ↑ There is no single authoritative translation of the Constitution. These translations are drawn from the translation by the United Nations, accessible at http://www.uniraq.org/documents/iraqi_constitution.pdf, page 5 of 43. ↑ Al-Marashi, Ibrahim; Sammy Salama (2008). Iraq's Armed Forces: An Analytical History. London and New York: Routledge. p. 215. ISBN 0-415-40078-3. ↑ Darwish, Adel; Alexander, Gregory (1991). Unholy Babylon: The Secret History of Saddam's War. London: Victor Gollancz. p. 13. ISBN 978-0-7881-5108-8. ↑ Pollack, 2002, p.175, citing Dupuy, Elusive Victory, 532–534, Herzog, Arab–Israeli Wars, 303–04, Edgar O'Ballance, No Victor, No Vanquished, 317–18, and Tzvi Ofer, The Iraqi Army in the Yom Kippur War, transl. Hatzav, Tel Aviv: Ma'arachot, 1986, p.128–65. Pollack notes that the various accounts of Iraqi operations on the Golan Heights are highly contradictory. He relies on Ofer, 1986, which is an Israeli General Staff critique of the official Iraqi General Staff analysis of the battle. ↑ "Shaking Hands with Saddam Hussein: The U.S. Tilts toward Iraq, 1980–1984". National Security Archive. Retrieved 11 October 2014. ↑ For a 1992 estimate of Iraq's armed forces, see James Bruce, "How Saddam is picking up the pieces a year after 'Storm'," Jane's Defence Weekly, 22 February 1992, 284. This piece estimates that Iraq might have 250 intact aircraft and between 22 and 27 divisions. ↑ Carter Malkasian, "A Thin Blue Line in the Sand," Democracy, issue #5, Summer 2007. ↑ "US Army Counterinsurgency Field Manual, December 2006" (PDF). army.mil. Retrieved 24 June 2016. ↑ "DoD Bloggers Roundtable Conference Call with David Kilcullen. May 25, 2007." (PDF). defendamerica.mil. Retrieved 24 June 2016. ↑ "Transcript of interview with Ltd Gen Martin Dempsey, June 1 2007" (PDF). defendamerica.mil. Retrieved 24 June 2016. ↑ "This Week in Iraq – MNF-I Newsletter, June 26, 2006" (PDF). Retrieved 11 October 2014. ↑ "Annex H 2010 Updates, January 2010". Retrieved 11 October 2014. 1 2 3 Karin Brulliard, "For Iraqi Soldiers, A Medical Morass", The Washington Post, May 7, 2005. ↑ "Maj. Gen. Cucolo interview, DVIDS, February 17, 2010". DVIDS. Retrieved 11 October 2014. Hemphill, Paul (1979) `The Formation of the Iraqi Army, 1921–33', in Abbas Kelidar (ed.) The Integration of Modern Iraq, pp. 88–110. London: Croom Helm. Sean Boyle, 'In wake of Desert Fox, Saddam moves to tighten his grip,' Jane's ChemBio Web/Geopolitical Resources (also Jane's Intelligence Review), 2 February 1999. Wikimedia Commons has media related to Military of Iraq. Measuring Security and Stability in Iraq, Quarterly reports from the US Department of Defense to US Congress.